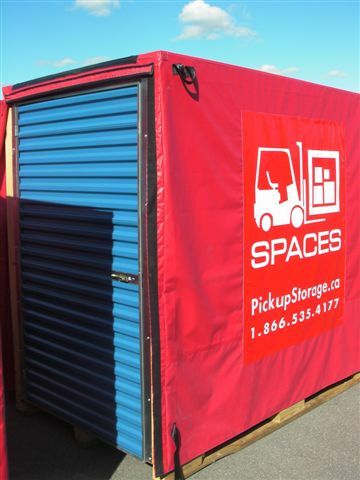 Jump on board now with our exclusive and innovative portable storage containers. These are the new go-to item when your planning a move or need to consider storage. We beat our competition through better pricing, friendly customer service, and knowledgeable staff. • Conveniently Sized – Our containers are 8’ tall x 5’ wide x 8’ deep. Each container can hold a maximum of 2000lbs and will hold 1 to 1.5 rooms of standard furniture. • Durable & Sturdy – Our containers are made of durable wood which allows the contents to breath. They are also placed on a secure skid for moving and transporting. • Weather-proof – each container comes with a weather-proof tarp if you will be leaving it on your property. • Large enough for Kings & Queens – Our storage container will hold queen and king sized box springs and beds. • Easy Access – designed with one light-weight steel door. It is also designed for ground level loading. Each unit measures approximately 6 inches off of the ground providing easy and safe footing for both entry and exit.